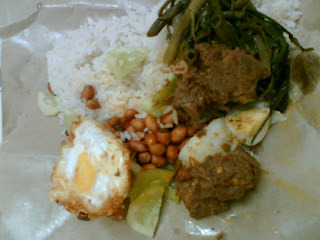 The best Nasi Lemak in Seri Petaling is located opposite of Lucky Restaurant. It only opens in the morning. Operated from a modest van and small table. Cater for "tapau" only. The lady boss will give you a packet of warm rice and you are encouraged to take the half boil egg, peanuts, anchovies, cucumber, sambal and the rest of the dishes by yourself. Thus, some "kiasu" will "sapu"a lot of everything. Price wise, it's reasonable. 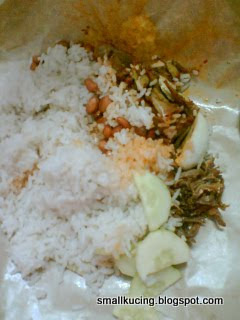 Yesterday, I "tapau" Nasi Lemak with additional rice and petai. It only cost me RM2. Opens daily. On weekends, you'll have to be there early or else you'll be left without even a crumb. You won't miss the stall as from far, you will see a crowd of people there.